At the end of February, Hon Susan Lenehan announced her intention to retire as independent Chair of the Board of Principals Australia Institute at the end of her current term in June 2016. Ms Lenehan reported that she was proud of the achievements of the Institute. She listed among them, the delivery of social and emotional health and wellbeing frameworks, KidsMatter Primary and MindMatters, in Australian schools, and the professional recognition of school principals through the Australian Principal Certification Program. Ms Lenehan also indicated the search for a new independent Chair had begun. She said that the Board seeks an experienced Chair with extensive involvement in governance related to commercial and not-for-profit organisations gained through successful leadership at board and executive levels. The new Chair will renew the Institute’s mission ‘to provide professional learning and support for school leaders and build the capacity and profile of the profession’ particularly in the promotion of social and emotional health and wellbeing. The Institute’s Strategic Plan for 2016 – 2017 focuses on the goals of strengthening school leadership and strengthening the profession. We will provide quality professional learning and support to principals and school leaders aligned with the Australian Professional Standard for Principals. The Institute will develop opportunities for school leaders with programs to promote and support social and emotional health and wellbeing in school communities. We will diversify products that meet the professional learning needs of school leaders in these areas. We will continue to support schools in the implementation of KidsMatter Primary and MindMatters through our national, state and territory offices. Over the next two months, we are undertaking market research and analysis for the development and implementation of strategies that will underpin our professional learning business and project delivery. We will invite you to contribute your perspective on our provision of professional learning and support of school leaders through a series of focus groups and an online survey. Principals Australia Institute is pleased to announce the important development of Leading Learning 4 all. The Institute created a set of six resources to support school leaders to assist all students in their learning and meet the needs of students with disabilities and additional learning needs. The resource was developed in conjunction with Australian Special Education Principals Association (ASEPA) with funding from the Commonwealth Department of Education. The resource was launched last month. For more information, and to register your interest in Leading Learning 4 all, please email us. In 2015, over 300 students from 176 schools participated in the Institute’s Student Principal for a Day (SP4D) event. The structured program enabled students to have a “hands on” leadership experience in schools across Australia. We were pleased to have sponsorship from Sherpa Kids. PAI expects to run the Student Principal for a Day again in 2017 to give students a practical taste of what it’s like to lead a complex organisation – their own school. To register your interest in participating in, or sponsoring, a Student Principal for a Day event, please email us. Read the latest KidsMatter Primary school story that describes how Tecoma Primary School in Victoria has embedded a shared strategy for wellbeing in the school community. To support secondary school leaders and teachers to improve mental health and wellbeing in their school communities, Principals Australia Institute is delivering a series of special Making it Matter events. Keynote presentations focus on current issues including e-safety for young people and diversity. Interactive, practical workshops have been specifically designed to help schools get started with implementation of the MindMatters framework, optimise communication with parents and manage staff self-care. Read more. 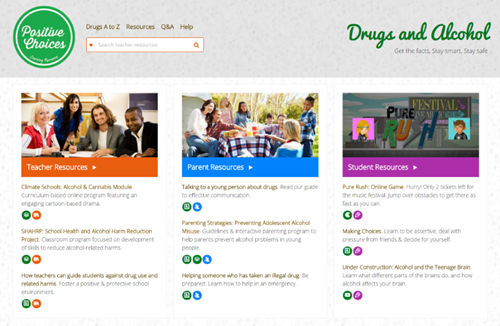 The Positive Choices online portal provides resources about alcohol and drug education for teachers, parents and students in primary and secondary schools. It is part of the Government’s drug and alcohol prevention strategy for Australian schools. The portal provides up-to-date information for students to make positive and informed choices. The evidence-based resources will help schools implement drug prevention programs that are proven to improve student wellbeing. EduTech is Asia-Pacific and Southern Hemisphere’s largest education event: one large exhibition and eight parallel conferences.